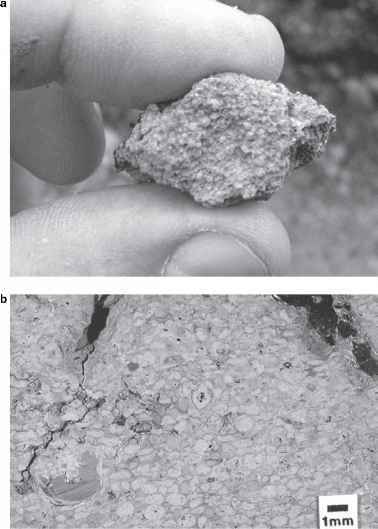 Figure 6.17 Occurrence of angiosperm pollen in samples from the Mud Buttes section (from Nichols and Johnson 2002). HC = Hell Creek Formation, FU = Ludlow Member of the Fort Union Formation; stars designate species usually restricted to Maastrichtian rocks. Reprinted by permission. 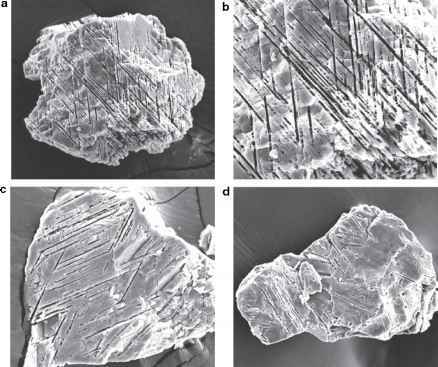 Figure 6.18 Scanning-electron micrographs of etched grains of shocked quartz from the K-T boundary at Mud Buttes (from Nichols and Johnson 2002). Individual grains measure 110 to 190 mm. "b" is enlargement of part of "a". Reprinted by permission. above the boundary - this is a fern-spore spike of the kind discussed in Section 5.3. The Mud Buttes locality is the most complete K-T boundary locality in the Williston Basin and the second best in North America. It has a strong (30%) palynologic extinction at the boundary and a fern-spore spike just above; a boundary claystone layer with associated iridium anomaly, shocked quartz, and spherules; plant megafossils from the richest known Cretaceous leaf quarry in the world (the single quarry yielded more than 85 species of leaves, Johnson 2002), as well as a series of Paleocene leaf quarries; vertebrate fossils including those used to argue for the highest stratigraphic occurrence of Cretaceous dinosaurs (Sheehan et al. 2000, Pearson et al. 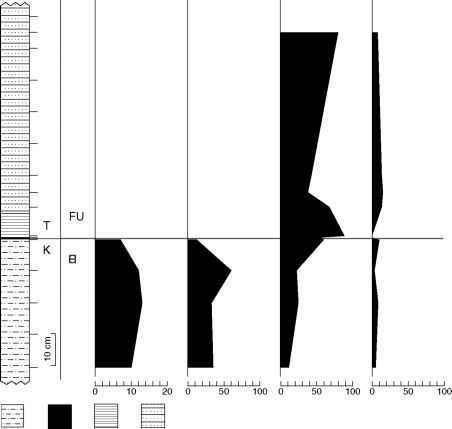 2001); and paleomagnetic data placing it within subchron C29r (Hicks et al. 2002). The only feature this section lacks is a radiometrically dated horizon. Figure 6.19 Spherules of tektite origin from the boundary claystone layer at the Mud Buttes locality. a - small hand specimen; b - polished section. 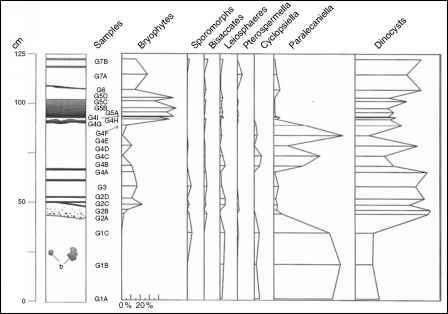 Figure 6.20 Numbers of K taxa (pollen restricted to Maastrichtian rocks) and relative abundances of K taxa, pteridophyte spores, and gymnosperm pollen in part of the Mud Buttes section (from Nichols and Johnson 2002). Strong increase in abundance of pteridophyte spores just above K-T boundary is the fern-spore "spike." Reprinted by permission. samples to verify the latest Maastrichtian age of the dinosaur. It also proved to be an interesting K-T boundary locality because of the absence of coal or coaly facies near the boundary. Note that occurrences of spores and gymnosperm pollen as well as angiosperm pollen are plotted in Figure 6.21.